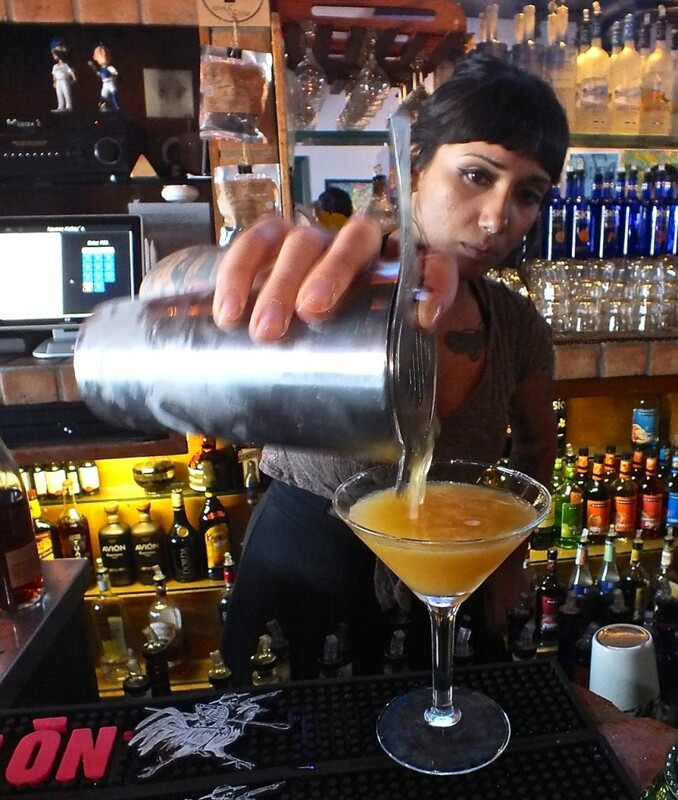 Long Beach has always been a great place to go and enjoy a good cocktail and dinner. This coming week there is even more reason to take a trip to Long Beach. September 21 through 27, Long Beach will be home to SIP LBC, the Long Beach Wine and Spirits Week. Many of the local venues are offering a “562” cocktail for $5.62, and several are also doing a food and drink pairing for $18.88. This will be a great place to try some new food and sip some cocktails crafted by Long Beach’s best mixologists, enjoy some wines picked out by LBC sommeliers and try a wide selection of local and imported craft beers chosen by Long Beach’s cicerones, the beer equivalent of a sommelier. Long Beach has a wide range of bars and restaurants, many brand new but some as old as the antique buildings that house them. Iguana Kelley’s has been around in the same building since 1960 and is one of the iconic bars of Long Beach. The building dates to 1913 and was the ‘Rose Room’ until new owners renamed it ‘Iguana Kelley’s’ in 1960. Steve Guillen and his wife bought Iguana Kelley’s in June 2013 and brought many years of bar and restaurant experience with him. One look at the original neon sign on the building and you can tell that this is a bar with a storied history. For SIP LBC, Iguana Kelley’s will be featuring three different drinks on the SIP LBC menu. The first one is a unique take on a classic. Steve explained, “One of our specialty drinks here is called an American Mule. It is our take on the Moscow Mule, except using American products. We use an American distilled vodka that is 100% organic; it’s called American Harvest. The American Mule is ginger beer, fresh lime, fresh mint and American Harvest Vodka. It’s a very, very refreshing drink and always good to drink, especially when it’s warmer”, Steve said. The drink was indeed very refreshing, with the fresh mint combining with the Gosling’s Ginger Beer to create a fresh, light taste. The vodka was very smooth and blended expertly into the drink so the flavors melded. Another refreshing craft cocktail that Denise, Iguana Kelley’s excellent bartender, has created along with Steve is the Pimm’s Blackberry Splash. Steve described it as a drink ”for people who don’t like gin or think they don’t like gin. They won’t taste the gin but they’ll like the drink!” The Pimm’s Blackberry Splash combines Noelet’s Silver Dry Gin, which has exceptional smoothness, Pimm’s Blackberry-Elderflower Liqueur, fresh lime juice and simple syrup. It is shaken and strained over ice, topped with ginger beer and garnished with a lime. Exactly as Steve described it, the drink had a smooth, refreshing taste with the herbal noted of the Pimm’s joined by just a bit of sweetness to create an extremely refreshing drink that’s great for our current warm weather. The third premium cocktail that will be featured for $5.62 on the SIP LBC Week is the Bulleit Bourbon Sunrise. The drink was created completely at Iguana Kelley’s and is very unique and very delicious. It is something that might make a Bourbon drinker forget about enjoying bourbon any other way. Bulleit Bourbon, fresh orange juice, brown sugar and orange bitters are shaken, strained and served up in a martini glass. The slight smokiness of the Bourbon is not hidden and works well with the herbal taste of the orange bitters. There is no doubt that this drink has Bourbon in it, but the other ingredients complement the flavor of the bourbon and make it an extremely enjoyable premium cocktail.It tasted delicious! The Downtown/Pine Avenue area is nothing like it used to be. These days, it is a destination place, great for walking, live music, great food and excellent bars. Right on Pine Avenue, Bo-beau has come into the area with a grandiose place and pulled it off exceptionally well. John Ethridge, Assistant General Manager at Bo-beau, talked about the new restaurant on Pine Avenue. “BoBeau opened up in Long Beach on May 15 as part of the Cohn Restaurant Group who owns 20+ restaurants, primarily in San Diego with a few in Hawaii also. There are two other BoBeaus, in La Mesa/San Diego and Ocean Beach/San Diego, however, we are quite a bit larger than they are. We pretty much operate like two restaurants in one, the first is our downstairs main dining room. It’s culinary experience is a little more formal, it’s a French bistro with global influence”. John took me upstairs, showing me the ‘rooftap’. “Upstairs, at our rooftap, ‘rooftap’ of course playing off the fact that we have so many taps, 50 total taps between the forty-six beers, two wines and two craft cocktails. One of the showcases of the rooftap open air beer garden is these two large metal boards displaying our draft beer choices. They all have magnetic lettering to them so if we change our taps, we can easily rearrange the lettering to the new tap. If for some reason the tap blows, or runs out of it, which it should never do, we can easily turn that metal board around, so people love coming up to that, just looking at all the beers. It just gives a different feel than just putting it on a paper menu or something that can’t be changed easily. It brings the selection to life and it’s such as large format that people do really realize how many beers that we have”. Beer isn’t the only thing Bo-beau has. John said, “One of the main features besides the taps that we have is that we have over 100 international vodkas, so people that love vodka can come and have quite a bit to choose from, everything from Svedka, which is known very well, to the high-end Stoli Elite. 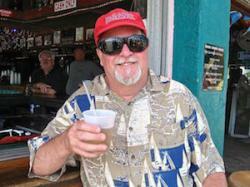 At all times, at any of the bars, any one of those vodkas, no matter how expensive it is, you can get for only $8.00. At the tables, you can get them for only $10.00. so you can even get something as high-end as Stoli Elite for only $8.00 at the bar or $10.00 at the table. Not only a great selection, but a great value as well. If you don’t like vodka, we have plenty of other selections, rums, gins, Bourbons and cordials. When a guest comes in they can see we have spared no expense when it comes to providing a selection of beer, wine and spirits”. For SIP LBC’s $5.62 special, John talked about the drink they will be featuring. “Our drink is something very unique. The reason why we picked this drink is that it is very unique to Bo-beau. 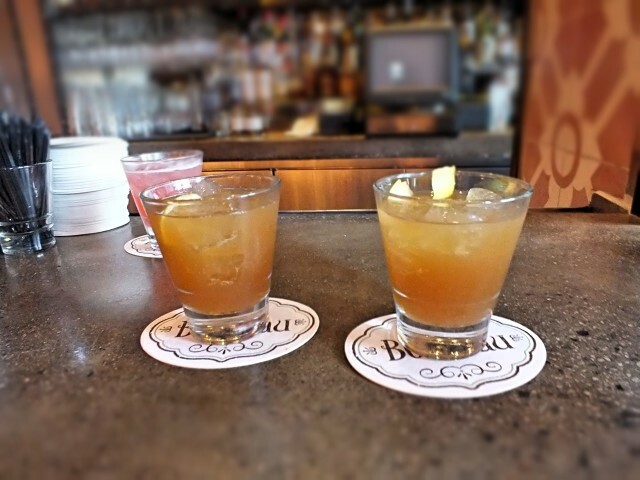 It’s a Bo-beau Sour, a craft cocktail made in-house on the premises, so none of the other places in Long Beach are featuring a craft cocktail that comes from a tap. This particular drink is made with Old Forrester Bourbon, a Chinese digestive and fresh lemon syrup so it is absolutely delicious! It really is unique, a craft cocktail made from a draft tap. I can’t think of anyone else that does this, so it makes us unique with our beverage program. The Bo-beau Sour has a healthy amount of alcohol, but it’s not overbearing. It’s a very balanced cocktail, a re-invention of a Bourbon Sour, except for the fact that it’s a draft cocktail. It’s a re-invention of an old classic. Craft cocktails are going in that direction anyways, re-invention of Prohibition-style cocktails”. Bo-beau is having both a food special also as part of SIP LBC. John said, “The SIP LBC special for food will be a Filet Mignon Flatbread, cooked in our special flatbread oven that we actually had imported from Washington state. The flatbread will be served with a Dubeouf Beaujolais Vllages wine as the $18.88 special. John said about the food, “Another thing that makes us unique at the Bo-beau is that we have the original Executive Chef, Katherine, who laid down the menu that is now prevalent at all three Bo-eaus, so we have her here, with experience at all three BoBeaus and it’s really given us consistency with our foods.With us being a new restaurant here to Long Beach, its been a great advantage having here here because she’s really made sure that the food has ‘knocked the socks off’ everyone here in Long Beach”. 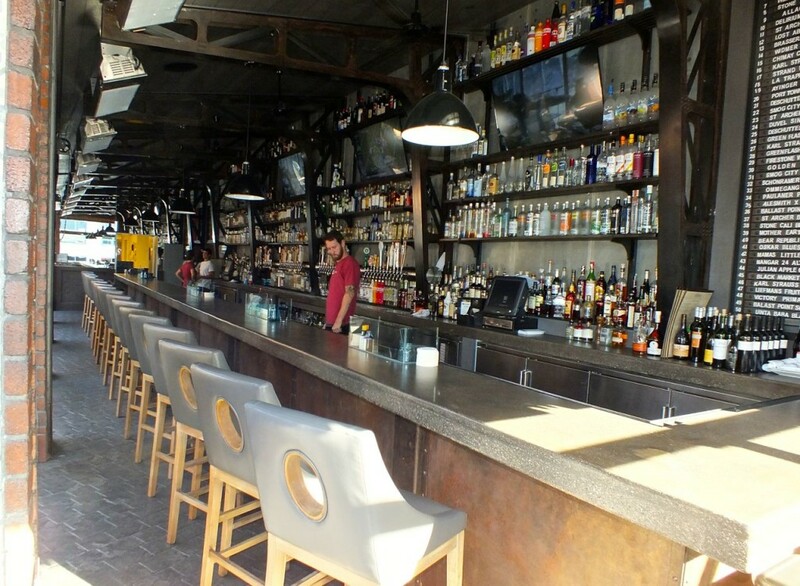 Bo-beau has already made quite an impression on Long Beach as a great place to build around an evening of art, music or just dinner and drinks in Downtown Long Beach. 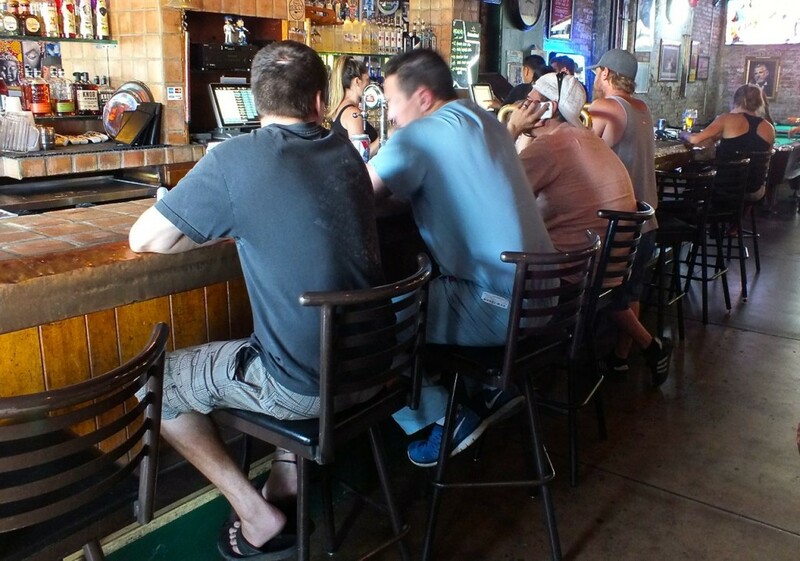 Fourth Street’s ‘Retro Row’ has been one of the major success stories of Long Beach. Once a street of dingy shops, it is now filled with art galleries, surf shops, antique stores, theaters and restaurants. Even though the building that houses Restauration on 4th Street in Long Beach is old, Dana Robertson has create a bright new place to be. “We opened Restauration two months ago. We wanted to be a little neighborhood bistro here in Long Beach. My husband and I live here, we’re partners and Eric, our Chef/Partner, also lives here”, said Dana “We have a large patio outside, a ‘hidden gem’ as a lot of people call it. We’re open for lunch and dinner and brunch on the weekends. ‘Modern Rustic’ is kind of how you could describe it. The food ranges from traditional American favorites with a little twist on them, that’s where we got the ‘finely re-crafted food and beverage’. We serve just fresh food, local vendors, we buy from local farm lots, I don’t buy from big purveyors. We use local coffee, local bread and then the rest we make in house”. For SIP LBC Week, Restauration is having several types of specials. Dana, who is a Certified Beer Server, the first level in the Cicerone Program that is to beer what wine is a sommelier, has selected three beers for the week’s $5.62 offerings. Dana’s tributes to Autumn are the Autumn Maple, Black Market Oktoberfest and Dogfish Head Pumpkin Ale. Dana described some of their other beverage choices as, “Eight beers on draft, six red and six white wines, by the glass or by the bottle. We’ve got awesome pricing on them. I like to make sure it’s a good value. We try to use smaller purveyors of wine than you usually see, you definitely won’t find them in the grocery store!”. Restauration will be featuring several wine or beer and food pairings for SIP LBC Week. For the SIP LBC $18.88 Dinner, the meal will start with a House Salad. As Dana described it, “This is our House Salad, I’ll call it our starter salad, even though there’s nothing ‘starter’ about it. It’s a fresh, clean salad, you’ve got some thinly sliced radishes, some ribboned carrot, a house-fresh crouton, heirloom cherry tomatoes, and then you’ve got a buttermilk-dill dressing on the bottom and then you’ve got a champagne vinaigrette tossed through on the top, plus some shaved fennel, celery and herbs”. The main course of the SIP LBC meal will either be a beef short rib or pork shoulder as the guest’s choice. A vegetarian option is also available. Dana described the main course as, “The chef has a lot of strengths, but a major one is how he textures and layers his foods. When you get a dish, there are all different types of crunch, silkiness, smoothness; he does it all so well, combines it. That way, you can look at your food, there is nothing hidden in it. What we encourage is fresh, clean food. It might be decadent, like the rich Brussels sprouts with the meaty short rib, but you know exactly what it is because you can see all the components of your food and we just pride ourselves on that”. 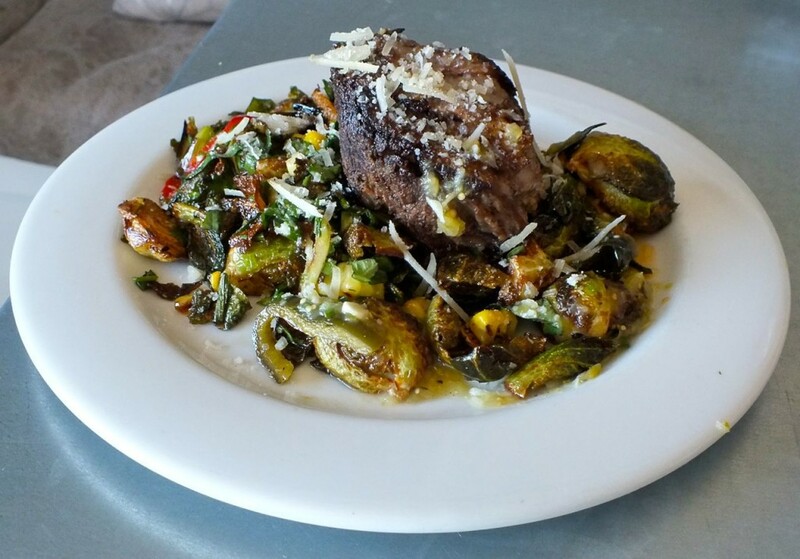 The short rib was tender and flavorful, while the interesting preparation of the Brussels sprouts added peppers to it, creating a really delicious dish. Along with the SIP LBC special, Dana has chosen an interesting wine to complement the meal. Dana said, “What we’ve got here, we try to use smaller purveyors of wine than you usually see, you definitely won’t find them in the grocery store! This one is a De la Haut, it is a Rose, from the Langedoc area in France, it is Grenache and Cinsault grapes. The Cinsault gives it that dry, citrusy flavor and the the Grenache beefs it up with a little minerality. Lighter color because of only a slight maceration process; it’s a lighter style with a beautiful blush color”. As part of the SIP LBC Week, Restauration certainly is offering a fresh, new place to enjoy a quality meal. In addition to the specials at over 26 restaurants and bars, SIP LBC Week is also having over a dozen special events such as Cutthroat Cocktail, hosted by Food Network’s Chef Rahm Fama at the Esplanade at theHotel Maya, Taste Whiskies from Around the World at the Auld Dubliner, Five Wines Across the Universe at Brix at the Shore, Muddle, Shake and Stir at Alegria and Tequila Tuesday…Okay, and Tacos too! at the Sky Room. Information can be found at the SIP LBC website for a full list of participating venues for both special events and a list of participating bars and restaurants. This looks like a week of fun you won’t want to miss! This entry was posted in Cocktails, Beer & Wine, Events, Food, Upcoming Events and tagged Bo-beau, Downtown Long Beach, Edward Simon, Iguana Kelley's, long beach, Long Beach Wine and Spirits Week, Pine Avenue, Restaration, Retro Roww, SIP LBC. Bookmark the permalink.